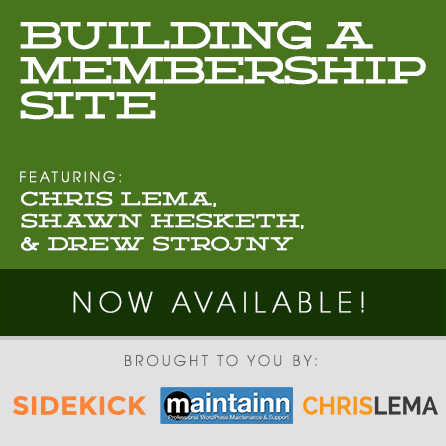 Learn the ins and outs of running a Membership Site from Chris Lema, Shawn Hesketh and Drew Stojny. These three guys really know their stuff. One has personally purchased, tested and reviewed all of the popular (and lesser-known) membership tools; one has been successfully running a membership site since 2008; and one built his own full-service membership platform after feeling dissatisfied with all other options. You'll get nothing but honest answers and unbiased feedback here. Join Chris Lema, Shawn Hesketh and Drew Stojny as they teach us the ins and outs of building Membership Sites. First we’ll learn about the many different membership tools that are available – specifically, which ones work best for your specific project needs. Next, we’ll learn from a membership site veteran about the strategies that actually have (and have not) worked for attracting and retaining a thriving membership base. Finally, we’ll conclude the session with an open panel discussion with all of our presenters. Chris has a LOT to say about membership sites. He has spent copious amounts of time – and hundreds of dollars – reviewing membership plugins, platforms, services, and strategies. There is no better person who can tell you what opportunities exist and which may be best for you (and, most importantly, why). Our session will culminate in an open panel Q&A with all three of our presenters. We’ll have a few prepared discussion points, but the purpose of this portion is for you to drive the conversation and ask the hard questions you want answered. Which Tools are Best? – Identify the best membership plugin and/or services for your project. Count the Cost – Calculate how much each member will cost you as well as your overall operational costs. Experiences Running a WordPress Site – What worked, what didn’t, and what you should do. Validating your idea for a membership site – Do people even want what you’re selling? Drip Content or Full Access – How you deliver content matters, learn which is right for you and your members. Access Restriction –Controlling who can see what. Video-Based Content– Where to host it, how to embed it, how to present it. Plan Pricing, Discounts and Promos – What is your content worth? When and why would you sell it for less than that? Recurring vs. Lifetime – What timeframe is best for you and your members? Tiered Memberships? – Should you have multiple benefit levels, multiple term lengths, multiple anything? Free Trials & Free Samples –What should you give away, and why? How well can you convert a free member? Member Retention – Learn how to keep providing value to your existing members to keep them happy and renewing. Refund and Cancellation Policies – If you cannot wow your members, how do you send them off? Social and Email Marketing – What are you telling prospects, what are you telling members? Shawn is the creator of WP101.com, a popular WordPress tutorial series for beginners. He’s also been a freelance designer for more than 25 years, helping small businesses connect more effectively with their audience. When he’s not recording screencasts, Shawn enjoys running, spending time with his wife and their three kids, or kicking back with a nice cigar and a glass of Scotch. Drew cares so much about great membership sites that he built his own full-service solution named Memberful. He takes pride in building great products and great experiences. You might know him better for his work with The Theme Foundry. In fact, you may be a fan of Drew’s work and not even know it – Drew contributed a lot to the default WordPress theme TwentyTwelve.